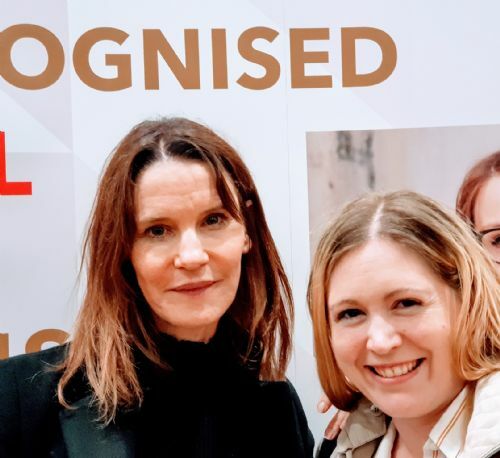 This weekend, I was privileged to be able to attend Susie Dent’s lecture on American English. 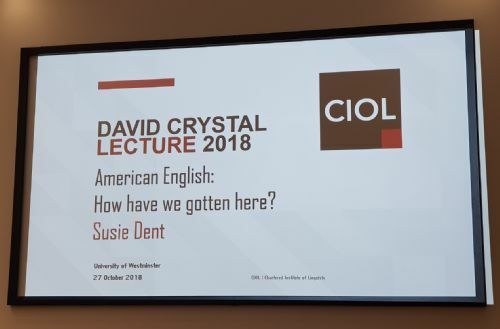 Organised by the Chartered Institute of Linguists, this was the second David Crystal Lecture, given by the winner of the David Crystal Trophy for outstanding contribution to the field of languages. Lexicographer Susie Dent of Countdown fame opened the lecture explaining that, while Countdown does not allow American spelling, it does allow American words, causing her to receive a lot of critical letters from unhappy viewers. After determining through a quick show of hands that a wide majority of the audience was in favour of ‘traditional’ British English, she then vowed to make us change our minds. She started by explaining the origin of the word 'bugbear', which used to refer to an imaginary beast invoked by parents to scare children into doing what they were told. American English, a bugbear for many, is seen as lacking the sophistication and subtlety of British English. However, American English can also be considered simpler and cleaner than British English. There is a myth of standard English (‘standard’ originally meant a physical flag that was the rallying point for a city or a country and came to represent authority), which is thought to be English as it should be spoken and written and which must be protected from foreign influence. However, English has borrowed from other languages for centuries, creating new expressions based on foreign languages and cultures (for example, the Anglo-Dutch wars in the 1600s gave rise to the expressions ‘Double Dutch’, meaning gibberish, and ‘going Dutch’, which originally referred to situations where one party was too miserly to pay for the others). Moving onto the topic of spelling, Susie pointed out that the spelling of the English language is notoriously chaotic and that there are more exceptions than there are words that follow the rules (amusingly, the famous ‘i before e except after c’ rule only works for in 20% of cases!). Spelling was first standardised in England when printing appeared, at a time when the North and the South of the country both spelled things differently. At the time, William Caxton, the man who brought the printing press to England, hired Flemish typesetters. They added silent letters where they would have appeared in Flemish (for example, the current word ‘ghost’ used to be spelled ‘gost’ until the silent ‘h’ was added to make it closer to the Flemish ‘gheest’). But silent letters were also in existence previously: medieval scribes sometimes added them to bring words closer to their Latin origin (transforming ‘dowt’ into ‘doubt’ to bring it closer to the Latin ‘dubitus), although they were mistaken about some of the etymology (‘island’ was thought to be related to the word ‘isle’, hence the silence ‘s’, but it was originally a Viking word). Going back to the topic of American English, she explained that some of the spellings we now consider to be American (‘honor’ instead of ‘honour’, ‘center’ instead of ‘centre’) were actually used more often by Shakespeare than their so-called British variants. Shakespeare also opted for the -ize spelling, which is still the style recommended by the Oxford English Dictionary today, as it is closer to the Greek etymology. The shift from -or to -our only became enshrined in the dictionary towards the end of the 17th century. However, the spelling is not consistent, as in the case of ‘honour’ and ‘honorarium’ or ‘labour’ and ‘laborious’. Some of American English’s divergences from British English were deliberately chosen through political will. As the American colonies separated from England, language became a battlefield. In the words of linguist Lynne Murphy, “rejecting the King’s English was another way to reject the King”. By simplifying the way words were spelled, the former colonies showed their linguistic independence and united around their new national language. In addition, many of the families on the Mayflower became inventors by necessity as they encountered new people, flora, fauna and phenomena. They borrowed from American-Indian languages and cultures (creating words such as ‘rattlesnake’ and ‘moccasin’ and the expression ‘to bury the hatchet’), re-used English words (naming places ‘New England’, ‘New York’, etc.) and invented words of their own (‘hollow’, ‘neck of the woods’). As time went on, American and British English evolved separately, leading to different accents and words. The cultural power of the United States means that we now use Americanisms constantly. However, it is a two-way-street. For example, American English has recently integrated the words ‘wanker’ and ‘gobsmacked’! To conclude, Susie Dent explained that the nature of language makes it messy and prone to change. Typos, hiccups, misunderstandings and political radicalism, among others, cause languages to grow and evolve. The only language that doesn’t evolve is a dead one! Very excited to meet my linguist crush!